The fast-growing Thuja x 'Green Giant' Arborvitae thrives in heat and humidity, which makes it an especially popular hedge choice in the regions around the Southern United States. With sturdy evergreen foliage, the tree keeps its color through the winter and looks healthy year-round. This arborvitae (Thuja 'Green Giant') InstantHedge unit is in a biodegradable cardboard container and ready to be shipped for a privacy screen. Neatly-maintained rows of arborvitae (Thuja) hedge ready to be harvested and shipped for landscape jobs. The lush foliage of this arborvitae (Thuja 'Green Giant') hedge can be trimmed to form a dense evergreen wall. Green Giant hedges in the field, nearly ready to harvest. A row of finished arborvitae (Thuja) hedges stretching as far as the eye can see. Root development of young plants is checked periodically to ensure that only the strongest plants are selected to form InstantHedges. Young starts of arborvitae (Thuja 'Green Giant') wait in a greenhouse to be planted in neat rows to form InstantHedges. With slightly upturned horizontal branching and scale-like dark evergreen foliage, the tree makes a great accent in any outdoor space. The durable, tall and quite strong-rooted and Green Giant makes an especially solid screen or windbreak hedge. 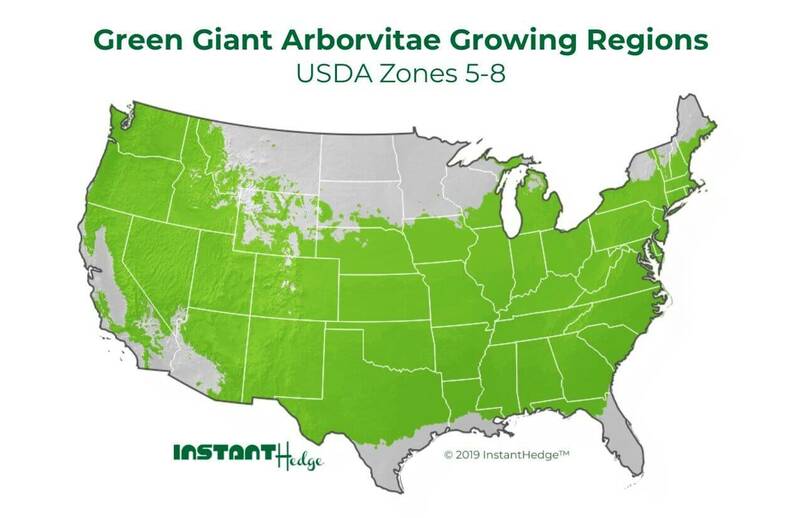 The Green Giant Arborvitae was introduced to the United States in 1967, when the U.S. National Arboretum planted a specimen sent from a Danish botanist. The Green Giant is a fast-growing arborvitae hybrid that has been promoted as a disease-free substitute for other varieties of cypress, especially in the humid southeastern United States. In the proper growing environment, the tree can grow exceedingly fast, up to 4 feet per year.The Thuja x ‘Green Giant’s narrow and dense pyramid-shaped habit looks neat even without pruning, but can be maintained as a compact hedge with regular pruning. Pest/Disease Issues: No major pest or disease issues. Bagworm and rots may occur. A stone walkway is guided along by a Green Giant arborvitae (Thuja x 'Green Giant') InstantHedge. The fine-textured foliage of the Green Giant Arborvitae (Thuja x 'Green Giant') softens this stone wall while providing excellent privacy. A faster-growing arborvitae (Thuja 'Green Giant') hedge like this forms an effective wall to make a private yard feel more secluded. For varied textures in the landscape, two different types of hedge can be used for more textural diversity. Here An English laurel (Prunus laurocerasus) and arborvitae (Thuja) hedge are both displayed. An arborvitae (Thuja) hedge can be grown to a larger height to provide screening of neighboring second-story buildings. A stone path is bordered with this lush, evergreen arborvitae (Thuja 'Green Giant') hedge.